Your company can support patient safety and education with a gift to the Anesthesia Patient Safety Foundation. As a 501c3 charitable organization, APSF can serve your company’s corporate responsibility, charitable giving and research goals. national and international exchange of information and ideas. With your generous contributions, APSF can achieve its vision that no patient shall be harmed by anesthesia. 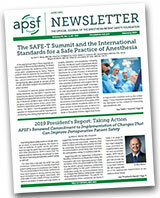 If your organization is interested in partnering with APSF to support patient safety, contact APSF President Mark Warner, MD at warner@apsf.org or APSF Director of Development Sara Moser at moser@apsf.org. For specific information about the benefits of corporate membership, please contact APSF Director of Development Sara Moser at moser@apsf.org. The Stoelting Conference, formerly known as the consensus conference, brings a defined group of approximately 125 leaders from perioperative professional organizations such as the American Society of Anesthesiologists (ASA), the American Association of Nurse Anesthetists (AANA), the Association of Operating Room Nurses (AORN), the American Society of Peri-Anesthetic Nurses (ASPAN), and surgical societies together with representatives from anesthesia-related industries and colleagues from insurance, human factors, and legal fields. The recommendations from these conferences have led to significant practice and other changes and improved patient safety. Examples include perioperative fire safety, vision loss, residual neuromuscular blockade, and operating room distractions. The 2019 Stoelting Consensus Conference is September 4 – 5, 2019 at The Camby Hotel in Phoenix, AZ. “The Deteriorating Patient” will be the topic this year. For more information about the benefits of sponsoring the Stoelting Conference, please contact APSF Director of Development Sara Moser at moser@apsf.org. The APSF has distributed $12 million in funding for anesthesia patient safety research projects over its 30- year history, leading to important discovers that have changed clinical practices, improved patient outcomes and supported the career development of anesthesia patient safety scientists. The results of these research grants have made significant contributions to the specialty. For more information on sponsoring a research grant, please contact APSF Director of Development Sara Moser at moser@apsf.org. © Anesthesia Patient Safety Foundation. All rights reserved. Website Development by EdensWorks, Inc.